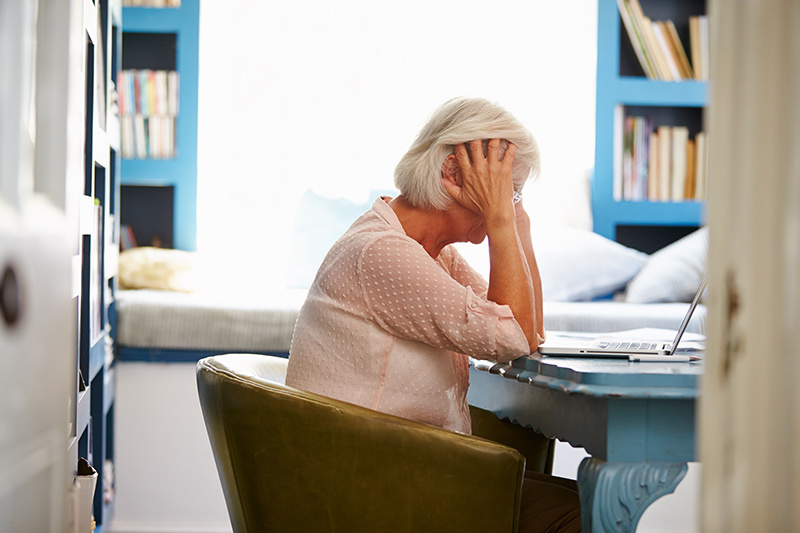 With digital media proliferating, there are more scams targeting seniors each year. While phone and email scams are still the most popular, software scams are on the rise as hackers take advantage of the fact that many seniors are known to have ample savings and aren’t as comfortable with technology, making them an attractive target and more vulnerable to covert threats than other age groups. According to the FBI, seniors are also less likely to report fraud because they don’t know who to report it to or are embarrassed to admit they were a victim. This makes knowing the most popular type of scams a crucial step in helping Certified Senior Advisors and seniors avoid them. Are You Already At Risk? While understanding common scams is important for preventing future problems, many seniors may already be at risk of identity theft if they have revealed personal information, such as their social security number or credit card number, via the phone or internet. While technological advances are partly to blame for increased risk, they’re also responsible for a number of innovative solutions. Thankfully, there are now many tools designed to help people minimize scam-related risks. LifeLock, for example, is an identity theft protection app that monitors a variety of risk factors and works to restore any data or privacy breaches that it detects. You can also use a well-researched and trusted anti-virus service, like McAfee, to prevent software scams, viruses, and malware. What Types of Risks Should I Watch Out For? Phone Scams: This type of scam is prevalent simply because of accessibility. Scammers can pay a low fee for a large list of targeted phone numbers, but they can also just dial random numbers and look for an unsuspecting victim. Elderly citizens are particularly vulnerable to phone scams because, unfortunately, they’re often more polite and trusting, and also happy to have someone to talk to. The IRS Scam is a popular method of scamming elderly citizens via the phone. A scammer will call and indicate that they’re with the IRS. They will then demand personal information for some alleged crime or tax fraud. In reality, the IRS will never initiate contact via the phone, so any claim otherwise is an immediate red flag that you’re dealing with a scammer. The Jury Duty Scam follows a similar pattern. Scammers call and impersonate a member of local government. They try to pressure the person on the other end of the line to reveal personal information, claiming that they missed jury duty and are now subject to immediate arrest if they don’t prove their identity. One reliable tip is to avoid answering phone calls from numbers that you don’t recognize. If the message is truly urgent, the caller will leave a message, and by listening to this you can determine whether it’s actually worth calling back. Even so — some scammers leave messages, so only proceed if you know for a fact that it’s legitimate. Email Scams: Similar to phone scams, email scams have a low barrier to entry for the scammer because it’s very cheap to buy a large email list, and the same message can be blasted to everyone on it, so it’s a widespread issue. Elderly citizens may have an even more difficult time identifying an email scam than a phone scam. There are countless unsolicited (but legitimate) emails that flood inboxes every day, so being able to separate out the spam can get very challenging for anyone. The Lottery Scam is a broad category that covers any type of email scam where unclaimed winnings are used as the bait to get the recipient to provide their banking information to “claim” the false winnings. This type of scam is called a “phishing” scam, which according to the Federal Trade Commission (FTC) is any scam that lures a recipient into providing information via false identification. The PayPal Scam occurs when a scammer impersonating PayPal emails people telling them that their PayPal account has been compromised, and that they need to send their login credentials manually. The scammer is looking for access to the recipient’s PayPal account. The advice is relatively similar, however, to that of avoiding phone scams: if you don’t recognize the specific email address it’s from, do not open the email and immediately delete it and/or mark it as spam. Software Scams: It takes a more sophisticated scammer to pull off a software scam. This category is potentially the most harmful of the three, because it involves losing access to your computer and all of its valuable contents. The Remote Access Scam is a type of software scam where a scammer makes a call and informs you that there is a bug in your computer. The scammer indicates that they need remote access (full remote control) of your computer to fix this issue. Once they have full control, they either install malware or steal everything valuable. The Anti-Virus Scam is similar, but doesn’t involve a telephone call. This type of scam can come in the form of an email, online pop-up or a landing page of a scam website, and there’s an urgent message that anti-virus software is needed to save your computer from viruses. An elderly person is especially likely to believe this sort of message, as they are less inclined to be technologically literate enough to determine whether their computer has a virus or not. No anti-virus software should be downloaded sight-unseen. Make sure to read reviews before purchasing or downloading any such software. According to the FTC, the best way to protect yourself from these types of scams is by avoiding pop-up messages that warn you about computer problems, unless you can verify that message is from your trusted anti-virus software (like McAfee). Where Can I Read More About Scams? It can never hurt to be more knowledgeable and prepared when it comes to the ever-evolving world of scams, which advance as fast as technology. Sticking to government resources (.gov sites) is a safe bet. USA.gov, for instance, has a thorough resource dedicated to scams and frauds. And the FTC (another government organization) even has a scam alert tool that will send you emails warning you of recent scams to be aware of. Check out their scam alert siteand sign up if you want to be extra safe. LifeLock is an identity theft protection service that monitors your credit and data risk so you don't have to.